In 2017, Parashuram Jayanti will be celebrated on 29th April, on tritiya of Shukla paksha. Lord Parshuram was born on Vaishakh Shukla Tritiya which is celebrated as Lord Parshuram Jayanti. According to the Hindu Vedic cast system, the task of wielding weapons and protecting the kingdom and its people was entrusted to the Kshitriyas – the kings and the warrior cast. 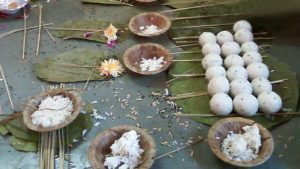 Over a period of time wealth and power corrupted them and they started oppressing and tormenting the other casts, including killing the Brahmins – the highly respected priestly cast who were there to guide them and to protect the religious aspects of the society. Hence Lord Vishnu took birth as Parashuram Avatara. Parashurama was the Great Grandson of Bhrugu Rishi and the son of the Rishi Jamadagni, who belonged to the Bhargava Gotra, and his Soorya Vamsi Kshitriya wife Renuka . His incarnation was to protect the Dharma and reinstate the Vedic culture. 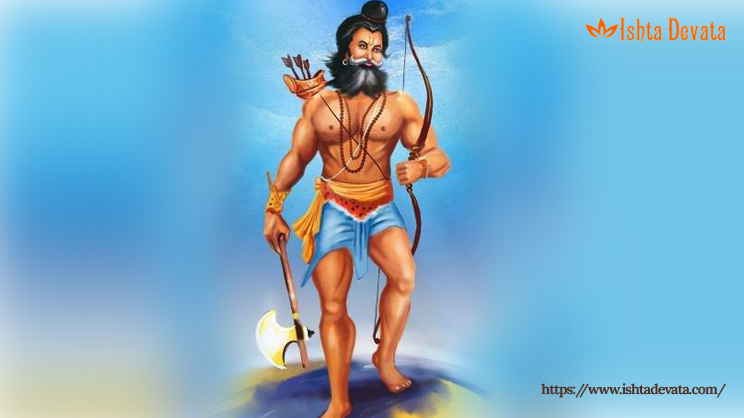 Not many know that Parshuram was a great devotee of Devi and learned the great Sri Vidya Tantra, also known as Sri Chakra Nava Avarana Pooja, from Lord Dattatreya, who is considered as the foremost Avatara and was the combined Avatara of Brahma, Vishnu and Shiva. It is Parashurama who first gave the Srividya to the world in his treatise known as the Parashurama Kalpa Sooktam. He also received an axe from Lord Shiva after undertaking a great penance to please him and learned from Shiva the methods of warfare and other skills. His father was killed by the Kshitriyas when Parashuram was away and in a rage he attacked 21 times and killed the various Kshitriya clans who were tormenting the people. He became such a terror for the Kshitriyas that when he went to Ayodhya, the great king Dasaratha hid under his wife’s bed. Parashurama spared Dasaratha – no doubt the Vishnu Avatara knew that in his next Avatara Dasaratha will be his father. Once the cleansing war was over, he donated all the land and wealth to the Kashyapa clan of Brahmins and also to the Namboodri Brahmins of Kerala. He went about creating several great temples and regions. In Kanyakumari Temple, he installed the Idol made of blue stone and installed the idol of Ayyappa on the peak of the Sabarimala Hill in the forest. He fought the advancing ocean and saved the lands of Konkan and Malabar – the Maharashtra – Karnataka – Kerala west coastline. He created a temple of worship right after he saved Kerala from the sea. He placed statues of various deities in 108 different places and taught the famous martial arts “Kalari Payattu” to protect the temple from the evils. With his divine powers, he also created the Goa-Konkan land by shooting an arrow. Parashurama though born in Treta yuga, is said to be an eternal Avatar still living. Later, during the Ramayana period, when Lord Rama broke the bow of Lord Shiva during the Seeta Swayamvara, Parashuram became angry and encounters Lord Rama but recognised Rama as the next Avatara and gave blessings. Ravana’s son Indrajit and Parashurama were only human on earth that had three weapons namely Pashupatastra, Brahmada Astra and Vaishnava Astra. Even during the end of Treta yuga and start of Kaliyuga, during the Mahabharata period, He was the guru of Bheeshma, Drona and Karna. The Kalki Purana states Parashurama will be the martial guru of Sri Kalki, the 10th and final avatar of Lord Vishnu which is about to come. He is the one, who will instruct Kalki to perform a long penance to Shiva to receive celestial weapons. Fasts are kept one night before this day and continued until the next day. These are very hard fasts mainly followed by women. They pray for happy and prosperous lives of their families. Lord Vishnu is worshipped on this day. As Lord Parashurama is an incarnation of Lord Vishu so they both are prayed together. Chanting of Vishnu Sahasranama is done, all night long without sleeping by the worshippers. People sing and dance all overnight to celebrate the Jayanti. 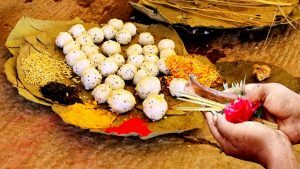 People who worship on this day also make a donation of food to Sadhus and Brahmans. This day is also known as Parshu Rama Dwadashi and people fast on this day to be blessed with a son. According to Varah Puran, by keeping a fast on this day, the devotee enjoys his stay in Brahmiok and will be reborn to become a great king.